Have you been following the planet Venus this season? 2014 sees the brightest planet in our Earthly skies spend a majority of its time in the dawn. Shining at magnitude -3.8, it’s hard to miss in the morning twilight. But dazzling Venus is visiting two unique celestial objects over the next week, and both present unique observing challenges for the seasoned observer. First up is an interesting close conjunction of the planets Venus and Neptune on the morning of Saturday, April 12th. Closest conjunction occurs at 3:00 Universal Time (UT) April 12th favoring Eastern Europe, the Middle East and eastern Africa, when the two worlds appear to be just 40 arc minutes apart, a little over – by about 10’ – the apparent size of a full Moon. Shining at magnitude +7.8 and 30,000 times fainter than Venus, you’ll need a telescope to tease out Neptune from the pre-dawn sky. Both objects will, however, easily fit in a one degree field of view, in addition to a scattering of other stars. Looking to the east the morning of April 12th from the U.S. East Coast near latitude 30 degrees north. Nearby stars are annotated in red by magnitude with decimals omitted. Created using Stellarium, click to enlarge. At low power, Venus will display a 59% illuminated gibbous phase 20” across on the morning of the 12th, while Neptune will show a tiny disk barely 2” across. Still, this represents the first chance for viewers to recover Neptune since solar conjunction behind the Sun on February 23rd, 2014, using dazzling Venus as a guide. Both sit 45 degrees west of the Sun and currently rise around 3 to 4 AM local dependent on latitude. This is one of the closest planet-planet conjunctions for 2014. The closest is Venus and Jupiter at just 0.2 degrees apart on August 18th. This will represent the brightest planet versus planet conjunction for the year, and is sure to illicit multiple “what’s those two bright stars in the sky?” queries from morning commuters… hopefully, such sightings won’t result in any border skirmishes worldwide. Now, for the mandatory Wow factor. On the date of conjunction, Earth-sized Venus is 0.84 Astronomical Units (A.U.s) or over 130 million kilometres distant. Ice giant Neptune, however, is 30.7 AUs or 36 times as distant, and only appears tiny though it’s almost four times larger in diameter. Sunlight reflected from Venus takes 7 minutes to reach Earth, but over four hours to arrive from Neptune. We’ve visited Venus lots, and the Russians have even landed there and returned images from its smoldering surface, but we’ve only visited Neptune once, during a brief flyby of Voyager 2 in 1989. From Neptune looking back on April 12th, Earth and Venus would appear less than 1 arc minute apart…. though they’d also be just over one degree from the Sun! The “shadow path” of the occultation of Lambda Aquarii by Venus on April 16th. Credit: IOTA/Steve Preston/www.asteroidoccultation/Occult 4.0. But an even more bizarre event happens a few days later on April 16th, though only a small region of the world in the South Pacific may bare witness to it. Next Wednesday from 17:59 to 18:13 UT Venus occults the +3.7 magnitude star HIP 112961 also known as Lambda Aquarii on the morning of April 16th 2014. Venus will be a 61% illuminated gibbous phase 19” in diameter. Unfortunately, although North America is rotated towards the event, it’s also in the middle of the day. The best prospects to observe the occultation are from New Zealand and western Pacific at dawn. The star will disappear behind the bright limb of Venus in dawn twilight before emerging on its dark limb 5 minutes later as seen from New Zealand. The path of Lambda Aquarii behind Venus as seen from New Zealand the morning of the 16th. Created in Starry Night. Note: New Zealand switched back to standard time on April 6th – it’s currently Fall down under – and local sunrise occurs around ~7:40 AM. Lambda Aquarii is a 3.6 solar mass star located 390 light years distant. As far as we know, it’s a solitary star, though there’s always a chance that a companion could make itself known as it emerges on the dark limb of Venus. Such an observation will, however, be extremely difficult, as Venus is still over 700 times brighter than the star! North Americans get to see the pair only 20’ apart on the morning of the 12th. One degree fields of view worldwide showing Venus and Lambda Aquarii at 7AM local. Credit: Starry Night. And further occultation adventures await Venus in the 21st century. On October 1st, 2044 it will occult Regulus… and on November 22nd, 2065 it will actually occult Jupiter! Such pairings give us a chance to image Venus with a “pseudo-moon.” Early telescopic observers made numerous sightings of a supposed Moon of Venus, and the hypothetical object even merited the name Neith for a brief time. Such sightings were most likely spurious internal reflections due to poor optics or nearby stars, but its fun to wonder what those observers of old might’ve seen. … and speaking of moons, don’t miss a chance to see Venus near the daytime Moon April 25th. Follow us as @Astroguyz on Twitter as we give shout outs to these and other strange pairings daily! “What’s that bright object to the southwest at dusk?” We’ve already fielded more than a few such questions as Earth’s sister world shines in the dusk sky. Venus just passed its maximum elongation 47 degrees east of the Sun on November 1st, and currently shines at a brilliant magnitude -4.46. This is almost 16 times brighter than the brightest star in the sky, -1.46th magnitude Sirius. Venus and the waxing crescent Moon, looking to the west tonite at 30 minutes after sunset for latitude 30 degrees north. (Created using Stellarium). Note that we say “theoretical” because there’s typically a discrepancy of a day or two between predicted and observed dichotomy. This is also known as Schröter’s Effect. One probable cause for this is the dazzling appearance of the disk of Venus. We typically use a variable polarizing filter to cut the glare of Venus down at the eyepiece. You might also note that Venus currently occupies the “basement” of the zodiac in the constellation Sagittarius. In fact, the planet is currently as far south as it can go, sitting at a declination of -27° 14’ on this very evening. 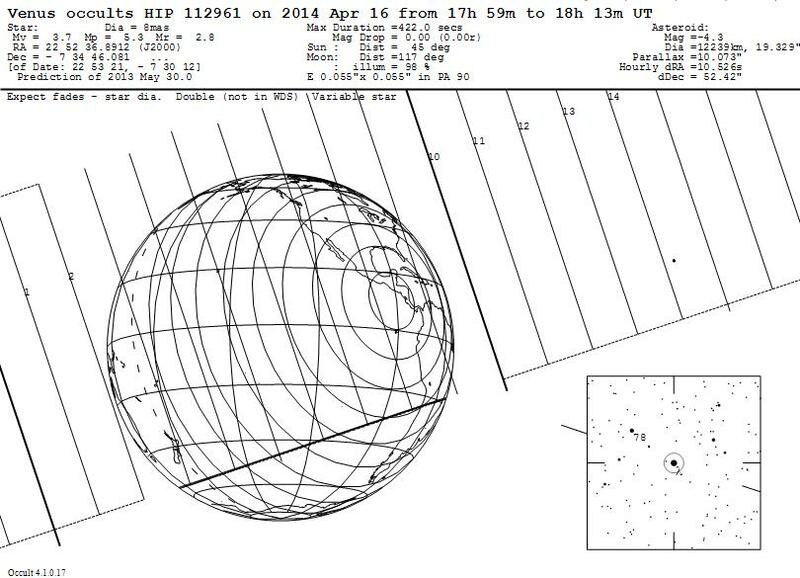 You have to go all the way back to 1930 to find a more southerly declination of Venus, just 12’ lower! Note that each event occurs on November 6th, and they’re spaced 8 years apart. Apparitions of Venus closely duplicate their paths in the sky over an 8 year cycle. This is because the planet nearly completes 13 orbits of the Sun for our 8. Venus “catches up” to the Earth on its interior orbit once every 584 days to reach inferior conjunction. It usually passes above or below the Sun from our vantage point, though last year it transited, a feat that won’t be witnessed again until 2117 AD. How far south can Venus go? Well, its orbit is tilted 3.4 degrees relative to the ecliptic. It can reach a southern declination of -28 05’, though you have to go way back to 1874 for its last occurrence! A daytime Venus near the Moon, transiting to the south at about 3:30PM EST today. A 5 degree wide Telrad “bullseye” is provided for scale. (Credit: Stellarium). Note that seeing Venus in the daytime is surprisingly easy, once you known exactly where to look for it. Your best chances are around mid-afternoon at about 3PM local, when the daytime Moon and Venus lie highest in the southern sky. Did you know that Venus is actually intrinsically brighter per square arc second than the Moon? It’s true! The Moon actually has a very low reflective albedo of 12% — about the equivalent of fresh asphalt — while the cloud tops of Venus are more akin the fresh snow with an albedo of about 80%. Its also worth checking out Venus and its local environs after nightfall as it passes near the Lagoon (M8) and the Trifid nebula (M8) on the night of November 6th. Continuing with its trek across the star rich plane of the heart of the Milky Way galaxy, Venus also passes near the globular cluster M22 on November 13th. The position of the Moon, Venus, Pluto, & New Horizons at 14UT on November 7th, 2013. (Created using Starry Night Education Software). Another shot at seeing Venus paired with the Moon occurs on December 5th. Venus also presents a maximum area of illumination on December 6th, and will shine at its brightest on December 10th at magnitude -4.7. Can you catch it casting a shadow? The best time to search for this illusive phenomenon would be just before New Moon on December 2nd. A dark sky site away from any other sources of illumination, and a snow covered ground providing high contrast also helps. Fortunately, snow isn’t in short supply in the northern hemisphere in December! Venus is currently the only naked eye planet in the November early evening sky. We always thought that it’s a bit of a cosmic irony that the nearest planet presents a dazzling, but featureless white disk as seen from Earth. Diligent amateurs have, however, been able to tease out cloud patterns on Venus using UV filters. Another elusive phenomenon to watch for as Venus reaches a crescent phase is ashen light. Long reported by observers, a faint glow on the night side of Venus is something that persists, but shouldn’t be. A similar effect seen on the night side of the Moon known as Earthshine is easily explained by sunlight being reflected off of the Earth… but Venus has no moon. What gives? Frequent explanations over the years have been aurorae, electrical activity, airglow, or, more frequently cited, observer bias. The brain wants to see a filled in space, and promptly inserts it betwixt the dazzling horns of the planet. Keep an eye on Venus as it reaches maximum brilliancy and heads towards inferior conjunction on January 11th, 2014, and a rare chance to see it on said date… more to come!